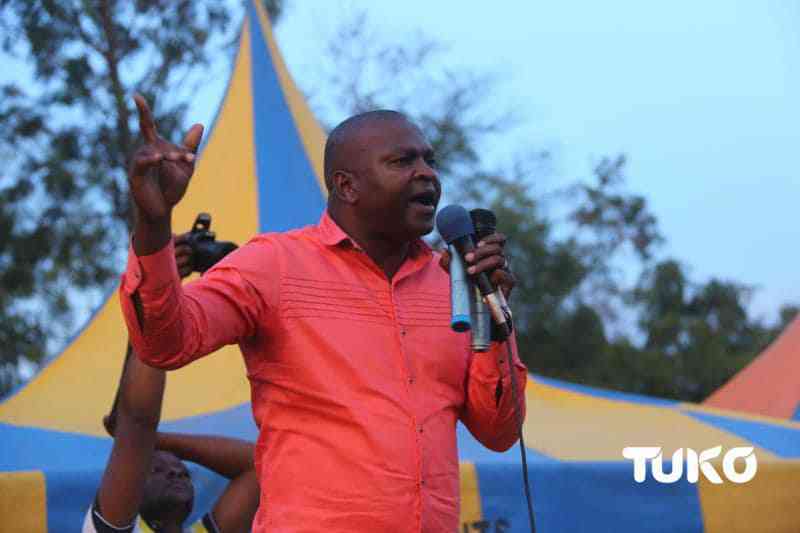 Former Sports Cabinet Secretary Rachid Echesa joined Jubilee party leaders in castigating Central Organisation of Trade Unions (COTU) Secretary General Francis Atwoli for saying Deputy President William Ruto's name will not be on the ballot in 2022. Echesa who was relieved of his duties as Sports CS under unclear circumstances termed as nonsense the remarks by Atwoli and also advised the COTU leader to desist from lecturing leaders from Western Kenya region on who to elect. In a Facebook post shared on Saturday, April 13, the youthful politician, believed to be one of Ruto's close political allies in the Western Kenya region, advised the fiery trade union leader to focus on feeding his wife instead of wasting his energy fighting the DP. "Mzee Atwoli...you cannot even feed your wife, and you want to lecture us leaders from Western region how we will elect our leaders...You should first go and feed your wife before talking nonsense about our next President. That is it," Echesa said. The former CS further told off Atwoli for allegedlylying to Mombasa governor Ali Hassan Joho that he (Atwoli) had the capacity to rally voters from the Mulembe nation to support Joho's presidential bid. He was, however, just one of the Jubilee party leaders allied to the deputy president who were irked by Atwoli's now controversial political remarks. "Atwoli is the age of my father. I will not insult him since that is not how I was raised. Respect your age! He (Atwoli) spews verbal diarrhea that leaves even a three-year-old wonder. Be your age. Stop embarrassing yourself," Duale tweeted on Saturday. Kericho senator, Aaron Cheruyot, added by demanding that Atwoli explains what he meant when he said Ruto's name will not be on the ballot and that Kenyans can take it to the bank. "I want to ask you Atwoli, when speaking in Mombasa where you said Ruto will not be on the ballot in 2022, we want you to tell us, are you planning to kill him (Ruto) or what are you up to?" the senator posed. Atwoli who was speaking in Lamu during a fundraiser for women's sacco had indicated the current DP's name would not appear in any of the ballot papers come 2022. "For all those you will elect, I want to tell you that the name of William Samoei Ruto will not be there, you can take that to the bank for free, those are not my words but words from the creator of heaven and earth," he said.